It is with great sadness that we learned that there was another tragic mass shooting of innocent people this week, this time in Thousand Oaks, California. While the motives of this particular gunman remain unclear, it is very unsettling that, as a society, we are unable to deal with the circumstances that lead to these kinds of shootings, which are almost always cases of people with mental health problems and access to firearms. Our heart goes out to the victims and their families and loved ones. 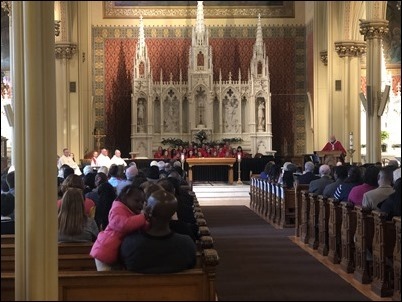 Saturday, I went to Mission Church in Roxbury for the Mass of Investiture for the new members of the Northeastern Lieutenancy of the Equestrian Order of the Holy Sepulchre. 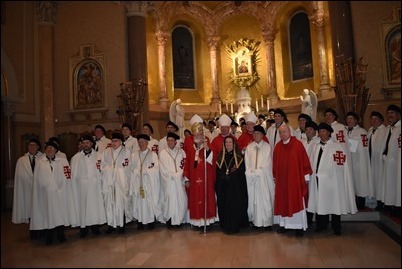 The Northeastern Lieutenancy is comprised of all the New England states, with the exception of Connecticut, and as Archbishop of Boston I serve as the Grand Prior of the Lieutenancy. There is a new Lieutenant, Gerry Foley, who recently took over for Jack Monahan, and he is doing a very fine job. We are grateful for his generosity in taking on this challenging post that Jack and Cynthia Monahan held so well for so long. The Order traces its roots to the Middle Ages, when it was actually a military order of knights pledged to defend and protect the sacred sites in the Holy Land. 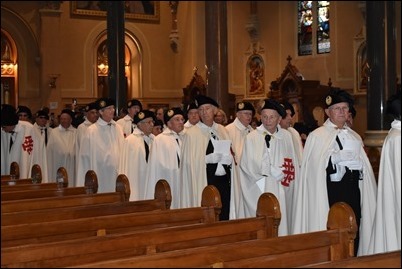 In keeping with that military history, the order is organized into Lieutenancies and the new members are symbolically presented with a sword and spurs. Today, members of the Order commit themselves to be faithful to the teachings of the Church and to support the Church’s works of mercy in the Holy Land, particularly schools, hospitals and clinics. This was a very large group of inductees, almost 100 people received into the Order. 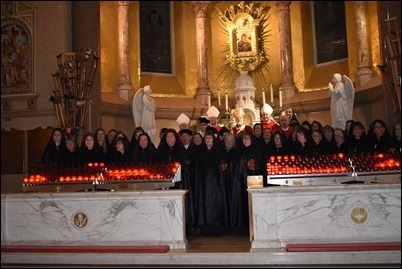 It is wonderful to see how they are growing so quickly and are so committed to the support of the Holy Land and the Church in the Middle East, where they are experiencing so much persecution. 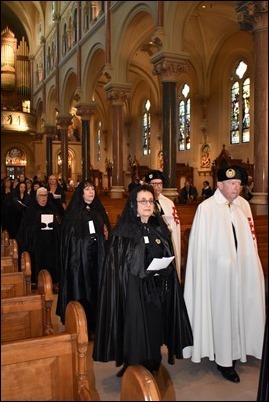 We are grateful to the Order of the Holy Sepulchre for all that they do. Following the Mass, there was a banquet at the Quincy Marriott where the seminarians of the Redemptoris Mater Seminary along with Father Jonathan Gaspar presented a musical show, to the delight of everyone. 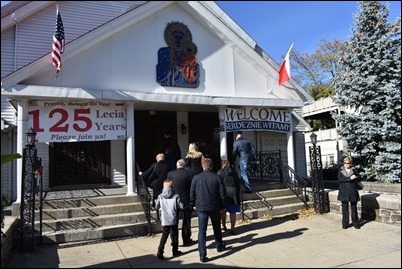 Sunday, I went to Our Lady of Czestochowa Parish in South Boston for the celebration of their 125th anniversary. 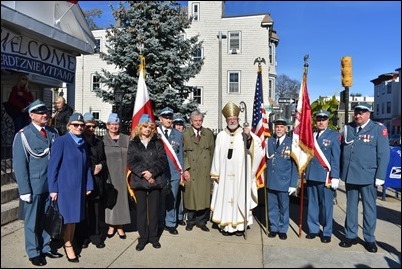 The parish was established in 1893 as the first Polish Catholic parish in Eastern New England, and there are still many Polish immigrants who find their spiritual home there. It was a wonderful celebration featuring two fabulous choirs, the adult choir and children’s choir. 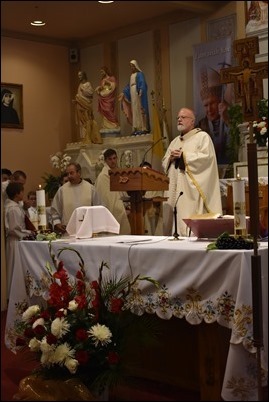 The pastor, Jerzy Żebrowski, was accompanied by a number of Conventual Franciscans including his provincial, Father James McCurry. 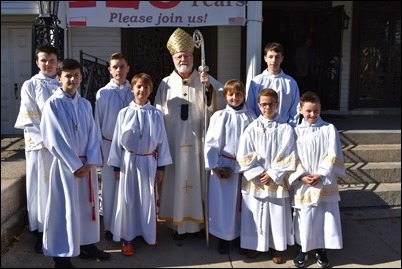 We were also joined by one of our young priests, Father Matt Conley, who is originally from that parish and was an altar server there. 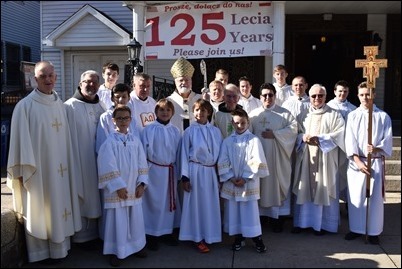 It was a wonderful way to mark the 125th anniversary of that vibrant community. 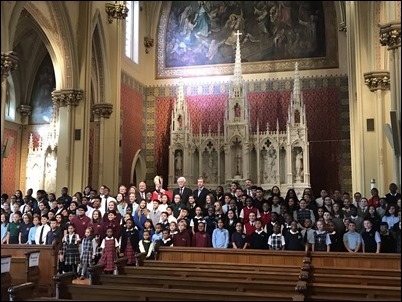 Wednesday, I went to Our Lady Help of Christians Church in Newton for the Catholic Schools Foundation’s annual Peter Lynch Scholars Mass. 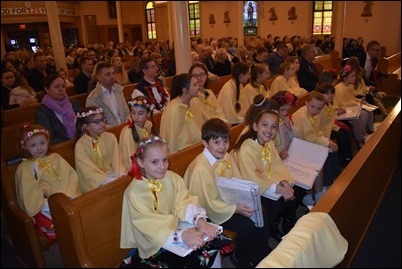 There were representatives from many different schools that have youngsters who receive scholarships from the Catholic Schools Foundation. The choir from Spellman High School sang for the Mass. The Catholic Schools Foundation has made it possible for so many young people to receive a quality Catholic education. We are very grateful for all the support of Catholic education that Peter Lynch and the Catholic Schools Foundation provide. As I mentioned last week, I have been holding meetings with priests of the different regions of the archdiocese to discuss the current situation of the Church. 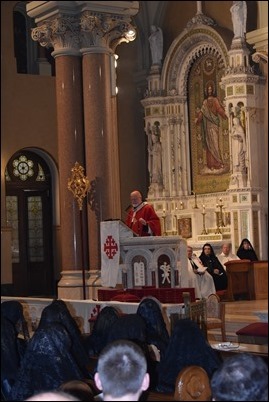 The last of these five meetings was with the West Region and was held on Wednesday at St. Timothy Church in Norwood. 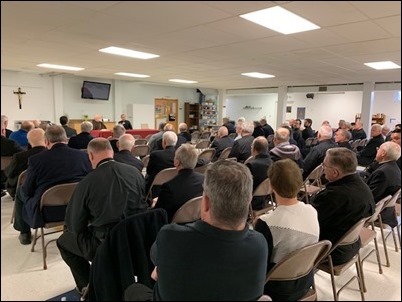 This meeting, like all the previous meetings, was very well attended by both priests of the archdiocese and religious priests and, of course, West Region Bishop Robert Reed the was there with me. 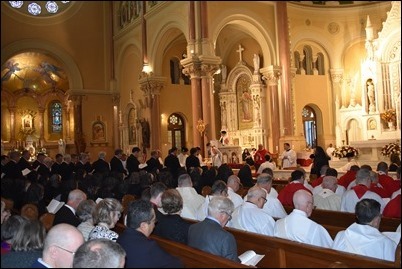 This was once again a chance to hear from the priests and receive the suggestions and comments. 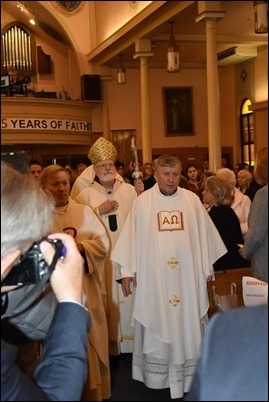 One of the things that came out of these regional meetings was a request by the priests for help in explaining to their parishioners what the archdiocese’s response has been over the last 15 years in the area of safeguarding children and providing care to victims and survivors. 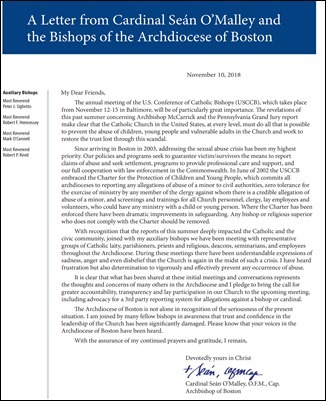 So, we have prepared a brief document outlining that information and we have asked that it be included in all parish bulletins throughout the archdiocese this coming weekend. 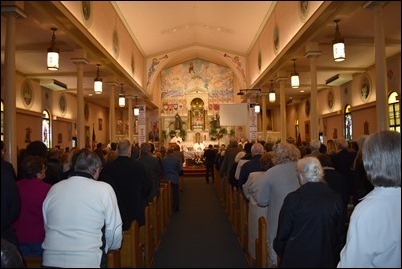 Finally, on Thursday, I went to St. Eulalia Church in Winchester for the funeral of Dolores Uglietto, the mother of our Vicar General Bishop Peter Uglietto. 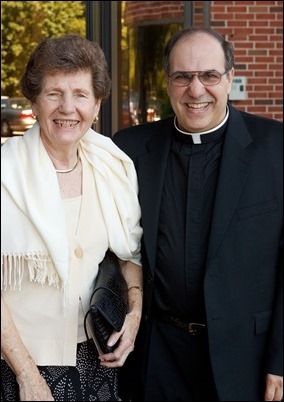 Mrs. Uglietto had been a member of that parish for over 50 years. 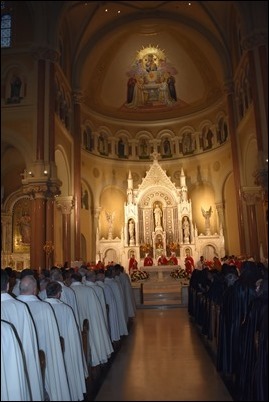 There were many priests and bishops there with us along with large numbers of friends and relatives. 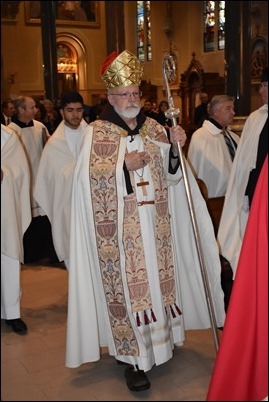 I was the main celebrant and, of course, Bishop Uglietto preached the homily, in which he gave a beautiful reflection on his mother’s life. It was a very beautiful sendoff.